The Lincoln County UW-Extension 4-H Youth Development Program and the 4-H Leaders’ Association have planned a fun filled camping season for all youth in Lincoln County. 4-H Camp is a great way to make new friends, experience new adventures, learn cooperation, learn life skills and pass on knowledge to others. 4-H camps offer new and different opportunities and activities. Youth become more confident and experience increased self-esteem. Youth develop more social skills that help them make new friends. Camp is another great way 4-H enables youth to learn and practice skills to be productive citizens. Lincoln County will be camping with Taylor, Portage and Waupaca Counties to offer two different camps — Junior Camp (June 8-9th) and Intermediate Camp (June 13-15th). Junior Camp is for youth (open to 4-H and non 4-H youth) in 2nd – 4th grade to gain life skills through hands-on activities, experience nature, meet and interact with other youth, and work in group settings. Bus transportation is provided for all campers/counselors/adults to the Central Wisconsin Environmental Station. The bus leaves early afternoon on Friday, June 8th and returns early evening on Saturday, June 9th. The Central Wisconsin Environmental Station (CWES http://www.uwsp.edu/cnr-ap/cwes/Pages/default.aspx) is a 200-acre teaching and learning center located 17 miles east of Stevens Point on glacial Sunset Lake. Intermediate Camp is for youth (open to 4-H and non 4-H youth) in 5th – 8th grade to gain life skills through hands-on activities, experience nature, meet and interact with other youth, and work in group settings. Bus transportation is provided for all campers/counselors/adults to Upham Woods Environmental Education Center in Wisconsin Dells. The bus leaves before noon on Wednesday, June 13 and returns early afternoon Friday, June 15th. Upham Woods Outdoor Learning Center (http://fyi.uwex.edu/uphamwoods/) provides educational opportunities through programs focused on environmental and leadership education. More information about each camp along with registration materials can be found below or from the Lincoln County UW-Extension Office located in the lower level of the Lincoln County Service Center at 801 N Sales Street in Merrill. Financial assistance in paying for camp is available. Registrations for both camps are due by May 15th. 4-H Summer camp is a great opportunity for youth . During camp there are countless opportunities to participate in fun age appropriate programming, meet other 4-H members, and develop life skills such as leadership, responsibility social skills, cooperation, teamwork, self-esteem, critical thinking and so much more! We hope you will consider joining us for camp this summer to have a great experience that you’ll remember for a lifetime! Earlier this summer some of our very own youth went to the 4-H summer camp with other youth from Portage, Taylor and Waupaca Counties. Here they meet tons of new friends! In addition to finding new friends they learned and created tons of new things. This will be a camp that many youth will remember for a life time. This year’s theme for both Junior Camp and Intermediate Camp was “Under the Big Top”. The theme was used throughout both camps duration. The older youth who served as camp counselors along with staff had fun planning around this year’s theme. 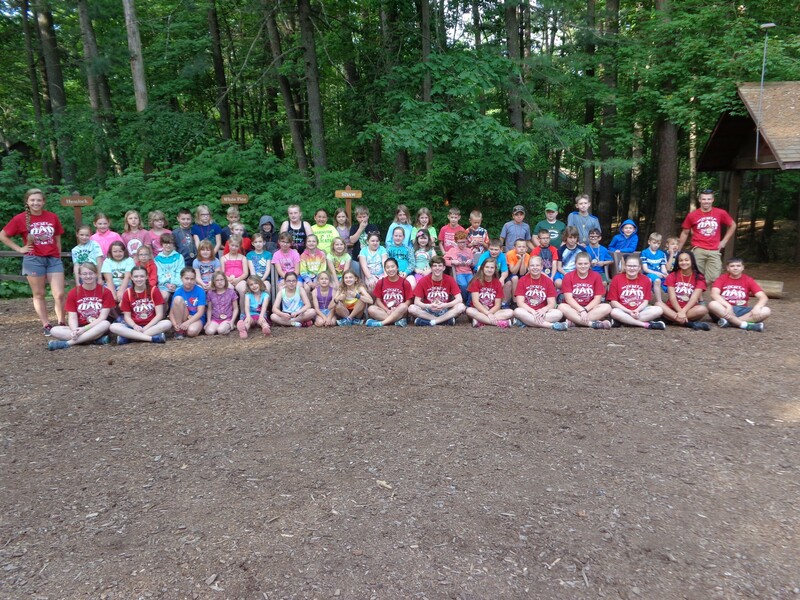 4-H Junior Camp held on June 9-10th was for youth in 2nd – 4th grade to gain life skills through hands-on activities, experience nature, meet and interact with other youth, and work in group settings. The youth were excited to be at the Central Wisconsin Environmental Station (CWES http://www.uwsp.edu/cnr-ap/cwes/Pages/default.aspx). The Central Wisconsin Environmental Station is a 200-acre teaching and learning center located 17 miles east of Stevens Point on glacial Sunset Lake. Since 1975, the Central Wisconsin Environmental Station has been an integral part of the University of Wisconsin – Stevens Point College of Natural Resources program and is staffed with professional natural resource and environmental educators. Their Mission is to foster in adults and youth the appreciation, understanding, skill development, and motivation needed to help them build a sustainable balance between the environment, economy, and community. The campers at Junior Camp had time to build team bonding skills through making arches from noodles and marshmallows. With many looking pretty good, and the team building was off the charts. They also got to test out their creative skills by doing some mask building, paintings, and finding a way to get all their cotton balls to safety. The youth got to bring home their masks, juggling balls, paintings and the natural brushes they made at camp. They also worked a bit on some math skills through some paper rockets they launched at a target. 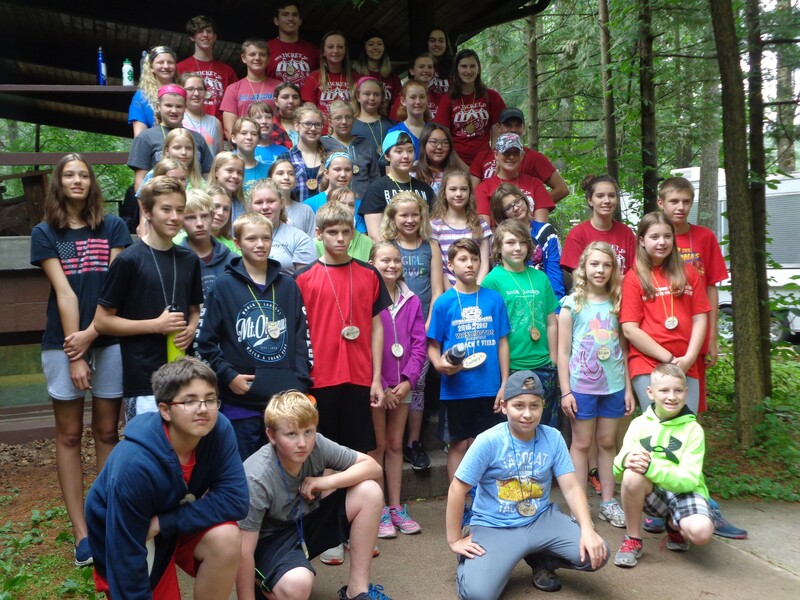 4-H Intermediate Camp held on June 29th to July 1st was designed for youth in 5th – 8th grade to gain life skills through hands-on activities, experience nature, meet and interact with other youth, and work in group settings. Youth were excited to be at Upham Woods Outdoor Learning Center (http://fyi.uwex.edu/uphamwoods/). The Upham Woods Outdoor Learning Center provides educational opportunities through programs focused on environmental and leadership education. Operating since 1941, Upham Woods is a model residential outdoor learning center, managed by the University of Wisconsin-Extension. The center sits on a prime location on the Wisconsin River, two miles north of the Wisconsin Dells, offering an excellent “river classroom” to study both the natural and cultural history of Wisconsin. The center rests on 310 total acres of forested land, including a 210-acre island called “Blackhawk Island.” The facility consists of 14 buildings including a fully equipped nature center and a raptor enclosure housing educational birds of prey. Campers at Intermediate Camp had a chance to take a trip in the Voyager Canoe, participate in arts and crafts and archery. They could also take a hike on Blackhawk Island or participate in a Peanut Butter Mountain course. 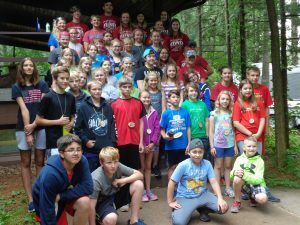 Youth planned and performed cabin skits, sang campfire songs and had a circle dance plus much more during their 3 day camp experience. The older 4-H youth leaders that served as counselors, including Lily Cordova, Bailey Iwen, and Keia Woller from Lincoln County, were a huge help in running both of these camps. They planned their own activities and at many of the different stations they had to help the adult staff members lead activities they possibly knew nothing about. Our counselors, this year, also had very wonderful signing voices which they utilized to sing the campfire songs and do some skits. Through their role as camp counselors, older youth in 4-H are provided with an opportunity to build important life skills such as decision-making, creativity, teamwork, communication, and responsibility. The activities at 4-H camp are intended to be educational for both the campers and the camp counselors. They give the participants a taste of the wide variety of activities available in the 4-H program and they give older youth an opportunity to develop leadership skills. Camping opportunities are sponsored by the Lincoln County 4-H Organization as an outreach program for youth countywide. 4-H Youth Leaders and Adult Volunteers plan and lead youth in camp activities. The camp program is developed with guidance from the 4-H and Youth Development Program, Lincoln County UW-Extension. There is a camp first aid person on duty who is a volunteer with first aid and/or nursing training. Campers will be under the direct supervision of older youth counselors (grades 9 and above) and/or adults. The ratio of adults to youth participants is 1:10 or less. Adult Advisors are active 4-H volunteers that have completed the youth protection process. Adult Advisors assist by monitoring youth activities, possibly leading activities, and assisting with camp operations. Participants will eat in the camp cafeteria; sleep in a bunk bed in a cabin or large dorm room with other campers and counselors of the same gender and use a restroom with private showers. Adult Advisors are assigned to sleeping areas in the same buildings, but separate areas from the campers. During camp, adults and youth will participate in large and small group activities which may involve any of the following: discussion, writing, reading aloud, problem solving, arts and crafts, singing, swimming a lake, canoeing, hiking, walking, role plays or skits, running, dancing, climbing stairs, standing or sitting for long periods, outdoor/indoor games, or having personal contact with other participants. A certified lifeguard will be on duty for swimming and canoeing activities. Life jackets are required and provided by camp for canoeing and a swim test needs to be passed to swim in certain depths of water. Please be aware that because of the nature of camp activities, some of them may involve an element of risk but the participant will also be taught safety procedures. We hope you can join us at camp this summer! Click here for 2013 Summer Camp Highlights! Click here for 2011 Summer Camp Highlights!